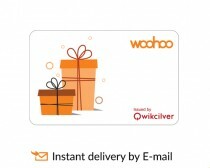 This GiftBig.com E-Gift Card can be used exclusively on the Woohoo App . The woohoo app is the latest innovation in the field of gifting bringing a multitude of the best and most diverse brands under one roof and enabling your loved ones to choose and spend directly at their favorite brand’s outlets. All that your gift recipient has to do is to download the Woohoo app, add the gift card they received and Start Spending!!! The GiftBig.com woohoo Gift Card brings together the two most powerful aspects of any gift, the freedom of choice and convenience. Your loved ones will get to choose where and how much they want to spend. The catalog of products and services extends from shopping sprees to fine dining, relaxing spa treatments to exotic vacation ideas. The choices are endless. Whatever the occasion, the GiftBig.com woohoo Gift card is the perfect gift for your friends and loved ones!!! 1. This E-Gift card is redeemable for all products on the Woohoo app only. Download the woohoo mobile app from Google Play Store for more details. 2. To use this GiftBig woohoo gift card, download the woohoo mobile app => Add Giftbig card details => Select a store to spend => Key in the amount and choose GiftBig as currency. 3. This E-Gift card is issued by QwikCilver Solutions. QwikCilver is a private limited company incorporated under the laws of India, and is the issuer of E-Gift cards. 4. This E-Gift card balance will not be redeemed for cash. 5. This E-Gift card cannot be used to purchase other Giftbig Gift card/E-Gift card. 6. In the event the beneficiary/Know Your Customer (KYC) details are found to be incorrect/insufficient, QwikCilver Solutions retains the right to cancel the E-Gift card issued. 7. This E-Gift card cannot be reloaded. 8. QwikCilver Solutions will not be responsible in case the card is lost, stolen or used without permission. If lost, the card cannot be replaced, nor cash refunded. 9. The card is valid for 6 months from the date of issuance. The card cannot be revalidated after the expiry. 10. No returns and no refunds on Gift cards, E-Gift cards and gift vouchers shipped by GiftBig.com. Please check the refund policy at http://www.giftbig.com/faq/#shipping for further details.